Q: Why should I buy Office 365 for IT Pros? A: Obviously, we think that Office 365 for IT Pros is the best and most up-to-date book about Office 365 available today. There’s no other book like it. The price we ask for the book is more than justifiable for the content we deliver across the complete Office 365 platform. We could have a nice business selling books that we update annually. But because we want our material to be as accurate, complete, and timely as possible, we choose the annual subscription model for each edition. This model allows us to release updates monthly and gives us the satisfaction of knowing that if Microsoft releases something new in Office 365, we can cover it in the next update. We also correct mistakes, improve writing, and generally tidy things up as we go along. The ePublishing platform allows us to do all of this pretty efficiently. From a buyer’s perspective, you don’t get text frozen at a certain point in time like you do with other books. You get every update we release for the edition you buy. In fact, because we integrate our updates into the book, each time we issue updates, you get a completely new book. In addition, you also get the chance to subscribe at a big discount for the next edition. 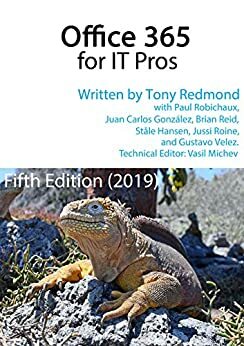 Just look at our change log to understand how much work and effort goes into keeping Office 365 for IT Pros updated and you’ll know what a bargain this book really is. Q: How should I use Office 365 for IT Pros? Q: How can I buy Office 365 for IT Pros? Head over to our book versions and prices page for the latest information about what we have available. We sincerely appreciate each and every subscription because it’s the support given by our subscribers is what keeps us going. Please use one of the browsers supported by Gumroad to make your purpose. Old versions of Internet Explorer just won’t work! Q: How do I get the PDF and EPUB versions? A: We use Gumroad.com (based in San Francisco, CA) to distribute our PDF and EPUB versions. When you buy a book, please remember to create an account on the Gumroad site so that you can continue to access updates as we release new files. If you forgot to create an account, you can go back to Gumroad and create one. You will then be able to return to your Gumroad account to fetch the latest updates. Your subscription gives access four files – PDF and EPUB versions of both the main book and companion volume. The receipt you get from Gumroad includes a View product link (see below) to download the files. If you click Copy Link Address in your browser, you’ll see that the View product link is in the form https://gumroad.com/d/201c497120603fde7a3972aac00d5c01. If you copy and keep this link safe, you can use it to access your book at any time. We send email to tell subscribers when updates are available, but you won’t get these messages if you unsubscribe for updates from Gumroad. Even if you do unsubscribe for messages sent by us, you can always go to your account to get the latest available files. We’ve received some notes from people whose update notifications end up in their junk email folder. Please check there if you can’t find them in the inbox. Q: I didn’t set up a Gumroad account. How do I get updates? A: You can always download the latest files using the link in your receipt even if you didn’t create a Gumroad account. Q: Can I get an invoice when I buy Office 365 for IT Pros? A: Yes. Follow Gumroad’s directions to create an invoice. Q: Are updates to Office 365 for IT Pros free? A: ​Updates and corrections to the current edition are made available to subscribers of that edition free of charge. For example, the subscribers to the 2019 edition (published in July 2018) will receive updates as long as that edition is current. Editions last at least a year, so a subscriber to the 2019 edition can expect to receive updates until July 2019. Q: I bought a copy of the EPUB/PDF version. How do I get updates when they are released? Subscribers to the EPUB/PDF version can always log onto their Gumroad.com account to download the latest available files. This is the easiest way if you can remember the name of the Gumroad account you created. You now see the four files (two for the main book – EPUB and PDF, two for the companion volume – EPUB and PDF). Click Download to download the file you want. A: Yes, Office 365 for IT Pros is available in the Amazon Kindle store. The companion volume is also available on Kindle. Please be aware that customers who buy Kindle books do not receive the same frequency of update notifications due to limitations with Amazon’s publishing processes. We ask Amazon to notify purchasers when we post updated files to the Kindle publishing process, but Amazon makes the call as to when and if they tell people that new files are available. This article offers some good tips as to how to fetch Kindle updates. Every edition of Office 365 for IT Pros has a different ASIN (Amazon Standard Identification Number). For instance, the 2019 edition has the ASIN B07F5ZPMNK. If you bought a Kindle book with that ASIN, you can benefit from the updates to the 2019 edition, but you can’t update your book to the new edition. In addition, we can’t offer Kindle subscribers the same kind of upgrade offers from one edition to another as we can for PDF/EPUB subscribers. Amazon takes 70% of the book price and that removes a lot of flexibility. It is possible to read PDF files on Kindle and this is a way to preserve the ability to get updates faster and receive offers for new releases. It’s also much easier to search the PDF than it is to look for something in a Kindle eBook. Some have also suggested that if you want to read on Kindle, you should use the Caliber eBook program to convert the EPUB file to MOBI format. Q: How do I get updates for the Kindle version? If you buy a Kindle version from Amazon, you can download free updates from Amazon.com. You do this from the Amazon site by going to Manage Content and Devices, select the book, and click on Update Available. Amazon can sometimes be slow at making updates available through this route (they want to avoid lots of extra downloads, so they force authors to go through hoops before they release an update). If an update doesn’t show up, you might have to ask Amazon support to delete the entry in your list and get a refreshed copy of the book. Q: What are the big differences between the 4th and 5th (2019) editions of Office 365 for IT Pros? A: First, there’s lots of new content, like the new chapter on Flow (23). Second, we have gone through every chapter to update the content, including all the parts that sometimes slip through our regular reviews. Third, we have added new content to the existing chapters to make sure that everything is bang up to date. Fourth, as we added new content, we took the opportunity to consolidate and reorganize the flow of the book so that it works better. Check out the new chapter on managing Office 365 Groups and Teams with PowerShell (14) to see what we mean. We keep on changing the book in response to what’s happening inside Office 365, so the 2019 edition is what we have been working on since June 2018. Every change made to Office 365 that we cover is in the 2019 edition. Q: Can I upload Office 365 for IT Pros to Google Play? A: You can. We recommend that you upload the PDF version to Google Play as some people have had problems processing the EPUB version. Bizarrely, if you convert the EPUB to MOBI format and back again to EPUB using an online file converter like https://www.online-convert.com, Google Play is happy to load it. Q: Is a print version of Office 365 for IT Pros available? Q: Can I print the PDF version of the book? A: Absolutely, if you have enough paper to hand. The current book is around 1,100 pages long, so it takes a lot of paper and ink to print – but you can do it and some people do. Q: What if I think something is missing from Office 365 for IT Pros? A: We welcome all feedback from readers, whether it be a mistake that we made, a topic that you think should be covered in more detail, or some topic relating to Office 365 that we are missing in the book. In all instances, you can send email to bookcomments@office365itpros.com to share your comments and ideas. We’ll consider your input and decide if we can fit in the coverage alongside the nearly 1,400 pages of content in the main and companion volumes. If we do go ahead and accept a request to cover a new topic, it’ll appear in a future update that we will make available to all current subscribers. Q: Why should I buy a book like Office 365 for IT Pros – isn’t everything about Office 365 free to read on the Internet? A: It’s true that a lot of information about Office 365 is available to read free of charge on the internet. We don’t intend to compete with what you can read from Microsoft or in blogs. What we offer is curated, up-to-date information that we think is important and valuable. We apply our own insight and experience to that information to highlight things that we believe Office 365 administrators and architects should understand, and we provide a lot of practical advice. And we keep on updating the material to make sure that it takes account of changes Microsoft makes to Office 365 (most, if any, blogs don’t do this, so they can be horribly outdated and just plain wrong). You have to put your own value on that work. We think that $49.95 is pretty reasonable. Think of it this way. If you employ a consultant to help with Office 365, they’ll probably charge you a considerable daily fee. Let’s use $1,000/day as an example – our book is 5% of that fee, and it’s updated all the time. We think you’ll get more value out of the 5% you spend with us (seven experienced MVPs) than the first 5% of a consultant’s day with you (24 minutes of an eight-hour day). Another way of looking at the issue is to consider how long it would take anyone to figure out some of the scripts that we include in the book. If a single script saves you a couple of hours of work, the book has paid for itself. And we have lots of scripts in the book. Q: I bought an older version of Office 365 for IT Pros. What can I do to upgrade? When a new edition is published, it contains significant amounts of new content (such as brand new features in Office 365). To make the transition easy, we offer subscribers a discount to upgrade to the new edition during the first few months after the publication of the new edition. Once this time has passed, the upgrade offer lapses and we’re afraid that you must buy a brand new copy.